Hands build houses. Hope builds homes. Publix Charities donated $5 million to Habitat for Humanity affiliates, homeless shelters, and other nonprofits providing housing to those in need. The donation is funding 40 new home builds across the Southeast, and Publix is stocking the pantry of each home. THROUGH DEDICATION AND HARD WORK, DREAMS CAN COME TRUE. That’s what Celeste Dowell of Tennessee wants to demonstrate to her two daughters, and that’s what she told Wilson Habitat for Humanity about why she applied for their homeownership program.1 For her and many others, the dream of affordable housing has become a reality thanks to their local Habitat for Humanity affiliates. Dowell’s home, dedicated in June of 2016, was fully funded by a grant from Publix Charities, along with 39 more Habitat for Humanity homes built throughout the Southeast last year. Then, in December, Publix Charities announced its largest gift to affiliates yet: a $5.5 million donation. As a result, over 120 affiliates are receiving support and 61 families are getting ready to move into their new homes. Publix Charities began its support of Habitat for Humanity in 1989. Since then, the foundation has made many contributions to help people who have gone through a rigorous application process to obtain a place to call their own. In addition to completing hours of “sweat equity” building their home or the homes of others, home applicants must demonstrate the ability to pay a mortgage and property taxes. They typically meet regularly with representatives of their Habitat for Humanity affiliate throughout the process. Some hold more than one job, and many have children at home, but successful applicants share a strong determination to make it work. Fast forward to a warm day in April 2017, when volunteers in green shirts gather around to hear how they will contribute to the project before them: Their local Habitat for Humanity affiliate is now building a home funded by Publix Charities’ 2016 donation. The volunteers are Publix Super Markets associates, here to make a difference in their community. When the new residents move in, they will be greeted with a fully stocked pantry courtesy of Publix. The same goes for every home Publix Charities has sponsored for the year. It takes time and materials to build a Habitat for Humanity home, but it also takes people who care. Publix Charities is proud to support affiliates throughout the Southeast as they continue to do great work, as well as to thank the Publix associates who will give their time and talents to help make a dream come true for the new homeowners. “Every family deserves an opportunity to have a roof over their heads and food on their table,” said Carol Jenkins Barnett, president of Publix Charities. “My father established our foundation in 1966 with a strong desire to see our communities thrive.” Over fifty years later, his legacy of giving lives on. 1 “Wilson Habitat Dedicates 66th Home.” Habitat for Humanity of Greater Nashville. 2 Barrett, Michael. “Publix Pays $75,000 Mortgage for Single Mother’s New Habitat Home.” The Gaston Gazette: December 6, 2016. It’s more than a house. It’s where the heart is. Publix Charities is donating $5.5 million to provide support for over 120 Habitat for Humanity affiliates, and to fund 61 new homes in our communities. Publix Super Markets will help make each house a home by greeting the new homeowners with fully stocked pantries. Publix Super Markets Charities is proud to welcome families into new homes funded by our 2015 donation of $4 million to more than 80 Habitat for Humanity affiliates. We asked one new homeowner what excited her most about having and building her own home, where she will continue to raise her two very active boys, ages 11 and 13. She replied that she values the privacy, security, and pride that come with homeownership. Publix Charities is pleased to have helped provide such an opportunity for her, her sons, and many more families throughout the Southeast. In 2015, Publix Super Markets Charities announced a donation of $4 million to more than 80 Habitat for Humanity affiliates across the Southeast. Now, we’re excited to share the progress as 40 new homes funded by this donation are built. 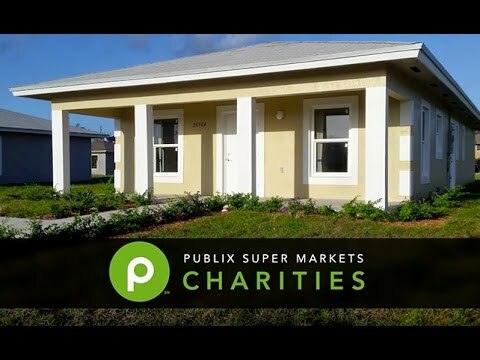 As you can see in the video, Publix Super Markets associates are generously volunteering their time to participate in the building process where possible, and Publix donates groceries to fill the pantries of the new homes that Publix Charities sponsors. For recent updates on other Publix Charities initiatives, visit the Latest News section. Publix Super Markets Charities is committed to meeting the basic needs of the communities it serves through additional financial support for housing. In honor of founder George W. Jenkins on what would have been his 108th birthday in 2015, Publix Charities announced a donation of $4 million to more than 80 Habitat for Humanity affiliates across the Southeast. Now, we’re excited to share that you can follow the progress as 40 new homes funded by this donation are built. Where possible, Publix Super Markets associates participate in building the houses as part of the Publix Serves campaign—an opportunity for Publix associates to gather together to make a difference in their communities. Publix donates groceries to fill the pantries of the new homes that Publix Charities has sponsored. Publix Charities began its support of Habitat for Humanity in 1989 with its first contribution to Habitat for Humanity of East Polk County (Winter Haven, FL). The foundation has continued its support, donating more than $1.1 million to Habitat for Humanity affiliates in 2014. The $4 million contribution to Habitat for Humanity affiliates in 2015 is more than three times the amount previously given in any year. “Every family deserves an opportunity to have a roof over their heads and food on their table,” said Carol Jenkins Barnett, president of Publix Super Markets Charities. “My father established our foundation in 1966 with a strong desire to see our communities thrive.” Fifty years later, his legacy of giving lives on. Publix Charities is committed to meeting the basic needs of the communities it serves through additional financial support for housing. The foundation also supports other important causes, such as food assistance, education, and youth programs. Read some examples of how the causes we support help to build healthier communities here. © Publix Super Markets Charities 2019. All Rights Reserved.